Discovering multiple uses for a single beauty product, finding a beauty use for a household good or uncovering quicker and easier ways to get things done really gets me going. 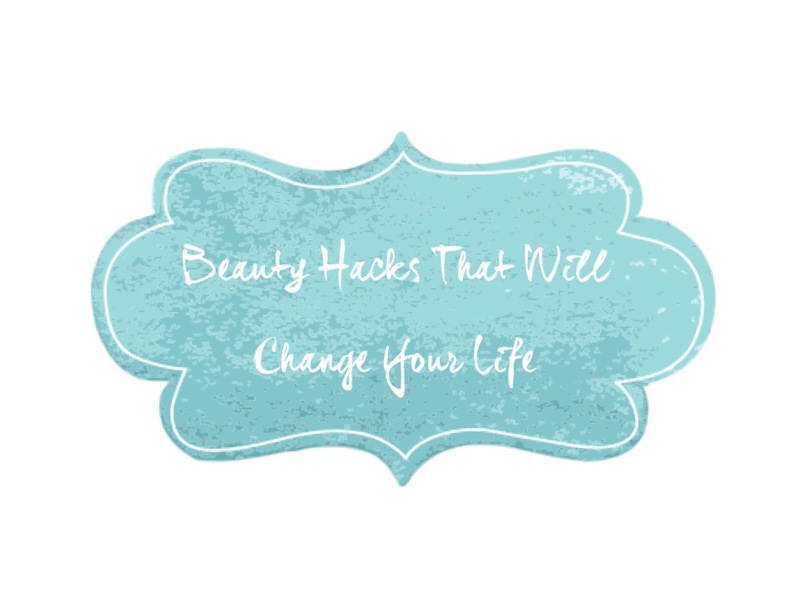 I’ve been building my list of these life-changing beauty hacks over the years, and I’ve finally compiled a list just for you guys. So without further adieu, let’s get to it! It’s surprising to me, just how many girls don’t own an eyelash curler. Like why wouldn’t you? Eyelash curlers are the secret to creating long, full lashes. All you’ve got to do is conduct a clamp-and-release exercise 3 times and your lashes will be looking longer than ever before. Whilst your lashes are still curled, follow with 2 coats of mascara and say hello to your new long, beautiful and voluminous lashes. Discovering this hack was a total fluke. I was playing around with my mascara and some of the product made it on to my eyelids, I tried wiping it off and then realised that it does a great job as an eyeliner! So if you ever find yourself out of eyeliner, all you’ve got to do is grab an angled liner brush, swipe it across your product-ridden mascara brush and then line your lids as normal. How often do you replace your pillows? Do you even know how often you should replace your pillows? Even though the amount of times that a pillow needs to be replaced, will vary from person to person, there is a sure-fire way of telling when it needs to be. Grab a naked pillow i.e no case and fold it in half. If the pillow stays folded and doesn’t open up, you desperately need to change your pillow! Btw, even though this isn’t really a beauty trick per se, isn’t it really helpful? During Winter, my lips tend to get really dry and flaky. I usually use Blistex’s Simple and Sensitive balm to combat any signs of dryness, however I haven’t been to Clicks recently and therefore haven’t restocked on my balm. I’ve been using Avène’s Cold Cream on my lips and it has been working wonders – it’s super moisturizing and formulated for dry skin hence why it’s really a winner on my lips. Any cold cream will work so just give it a shot! There’s a lot of skepticism when it comes to using baking soda for beauty purposes but I’ve been doing it for ages now and I have no complaints whatsoever. If your hands/feet ever feel dry and rough, add some baking soda to your favourite body wash and get exfoliating. The granulated texture of the baking soda helps in eliminating rough dry skin and providing soft and smooth skin. Just ensure that you only exfoliate for no more than 2minutes on each hand/foot – you don’t want to scrub off your body parts now! If you’re attending an event or function or just doing your makeup for fun – like me – and your normal brown-toned eyeshadow primer/base is killing the effect of your eyeshadow, you may want to add another product to the mix. After I apply the eyeshadow base to my lids, I follow up with a white pencil liner that covers my entire lid and then continue with my normal eye makeup. The white eye pencil allows the eyeshadow to display more of it’s pigment than usually would be allowed had the white pencil not been used. I once found myself in a situation in which I forgot to purchase a new tube of mascara and had to find creative ways to stretch my mascara until the following weekend – which was when I’d be able to go into a store to purchase a new one. All you do is add a couple of drops of the solution or eye drops into the tube, insert the brush and wiggle it around and voila! You’ve just revived your mascara! Please note that this is only a quick fix and shouldn’t be used on old mascara (i.e mascara older than 3/4 months). Waking up to puffy, red eyes is the worst ever – puffy eyes don’t take well to eyeliner and mascara and even if they did, they still wouldn’t look good. Whenever I have the misfortune of waking up to such horror, I pour a glass of ice water over a dry wash cloth and then hold it against my eyes. Even though, the iced cloth is quite painful in the sense that it’s so cold, it does a remarkable job of decreasing puffiness and returning my eyes to almost normal. And that’s it for this post, there are a few other beauty hacks that I haven’t included in this post, but perhaps that just calls for a part 2!